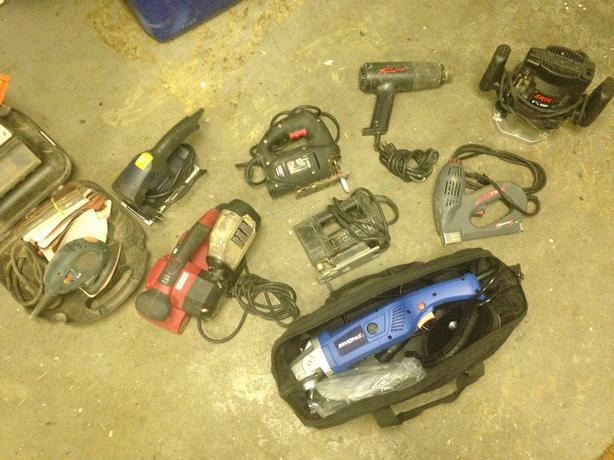 Remaining power tools are: 2 jigsaws-Black and Decker and Jobmate, and a Mastercraft sander. They all work great. Other tools for $10 are an Arrow electric staple gun, and a Mastercraft digital multimeter. All work great too. There is also a bin of assorted tools - Caulking guns, screw drivers, hammers, wrenches, pliers, vice grips, scrapers, small level, assorted drill bits, miscellaneous hardware, and more. Also: a bin of some painting tools & painting equipment & drywall trowels and hawk. Whatever your interest, I'll take the best offer for these.